This book project examines how elected representatives, and their constituents, prioritize between local particularism and broad policy. For decades, the prevailing logic has held that members of Congress engage in distributive credit claiming to the detriment of broad, national policy. Does this distortion in representation still apply, or has it taken on a new complexion in today's partisan electoral environment? With many elections more about turning out the base than swaying the undecideds, are policy appeals as electorally unimportant as they once were? The dissertation engages these questions by leveraging observational data, survey experiments, and an original data set on campaign advertising strategies. Altogether, the results demonstrate that the tradeoff between distributive goods and broader policy is significantly misunderstood with respect to constituents and representatives alike. "Particularism or Policy? Reevaluating the Electoral Connection." Claiming credit for particularistic goods is a key electoral strategy for members of Congress. Existing work contends that voters respond positively to these local projects, but are less likely to reward members for their efforts to pass general national legislation. Few studies, however, explicitly examine the electoral effects associated with a member's policy achievements. Do distributive appeals elicit such benefits, and are policy claims so ineffective by comparison? Using experimental and observational data, I find that the tradeoff between local distributive goods and broader policy is significantly misunderstood with respect to voters and members alike. The survey experiments, conducted during the 2012 elections, examine how different types of claims shape voter evaluations. The results suggest that policy-based appeals perform as well, if not better. 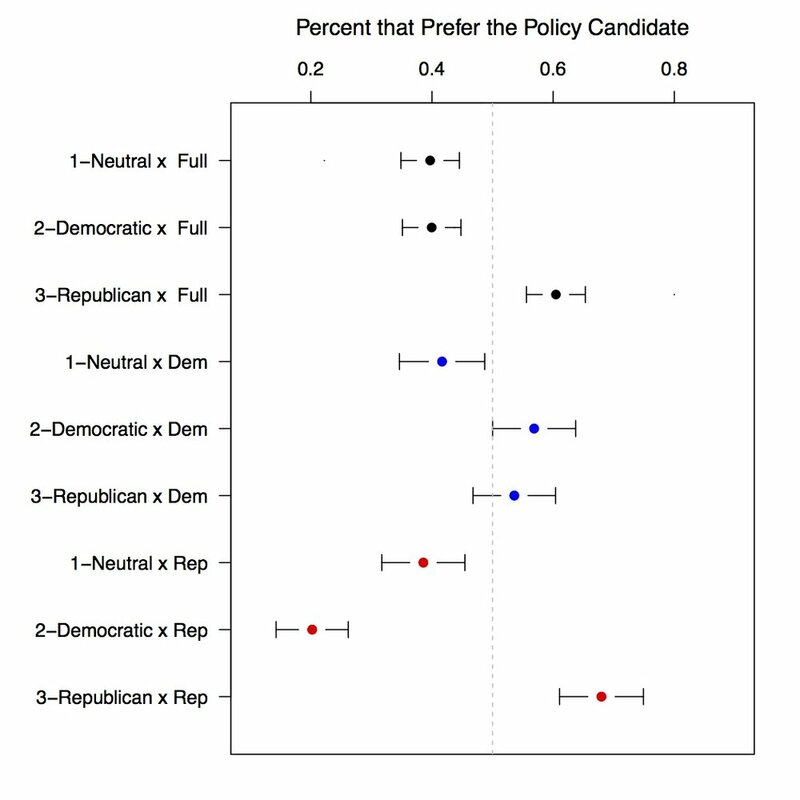 Using an original data-set on campaign advertising, I then demonstrate that policy claims are not only common, but preferred by candidates in competitive races. "Education Reform after NCLB: Popular Support and Partisan Divisions." Despite significant bipartisan support at the time of passage, No Child Left Behind (NCLB) has failed to meet the expectations of parents, school officials, and politicians alike. The prescriptions for reform, however, are anything but bipartisan. Since NCLB was signed into law, elite opinion on education policy has grown more divisive on issues ranging from student testing to school choice. But, have voters polarized as well? I examine this question using an experimental design that studies how subjects evaluate Democratic, Republican, and Bipartisan policy provisions. Using text from amendments to the Student Success Act (H.R. 5), the study tests how constituents respond to different proposals currently being debated in Congress. In the end, I find that voters do not exhibit the same partisan tendencies as officeholders. Indeed, the results suggest that there is widespread support for Bipartisan and Democratic issues, irrespective of the subject's party identification. "Shaping the Agenda: A Text Analysis Approach to Studying Group Preferences," with James McVey. This project studies how groups shape legislative priorities by first identifying what these actors want from government. Instead of relying on traditional measures of group interest, we employ a text analysis approach to examine how different policy organizations formulate their prescriptions for officeholders. The study's corpus consists of all testimonies from the last fifteen years given by the Brookings Institution and the Heritage Foundation. Using these documents, we analyze the common themes and policy ideas put forward by two of the most influential think tanks in Washington D.C. By exploiting changes in partisan control, we also explore how group demands receive different levels of support during favorable and unfavorable political contexts. "Presidential Confidence in Crisis: Blame, Media, and the BP Oil Spill," with Stephen Goggin, (September 2015). Presidential Studies Quarterly. Recent studies find that voters regularly punish presidents for seemingly unrelated events, despite a clear understanding of how these issues become tied to the president. We contend that the media plays an important role in creating this link. Testing this, we examined how the 2010 BP oil spill shaped evaluations of President Obama, paying particular attention to news coverage to isolate the event's applicability to the president. We estimate the causal effect of these different frames by matching respondents from a pre-spill control group to two separate treatment phases, finding that presidential confidence decreases once the media begins attributing political blame. "A Crowded Agenda: Labor Reform and Coalition Politics during the Great Society," (April 2015). Studies in American Political Development. For much of the postwar era, conservative forces blocked progressive labor policy from reaching a floor vote. With huge Democratic majorities in Congress, the 1960s represented a rare opportunity for unions to substantively alter industrial relations policy. Organized labor, however, made few gains during this prolific era. Despite labor's central position within the governing coalition, Democrats repeatedly failed to pass its most important legislative ambition, the repeal of Taft-Hartley's right-to-work clause. By analyzing the Democrats' legislative priorities during the Great Society, I show how coalitional politics structured the party's policy agenda, and how this ordering affected legislation in turn. With the infusion of new coalitional demands, party elites strategically placed labor's controversial issue at the end of a long legislative agenda, effectively eliminating any chance for passage. Rather than locating all blame with the usual suspects, this rarely studied episode suggests that President Johnson and his leaders in Congress played a central role in the bill's failure. The study provides new insight into the process, and consequences, by which party leaders decide whose issues to prioritize when setting the agenda.